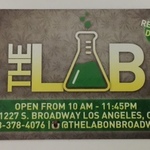 The Lab is a full-service medical marijuana dispensary, working towards helping every member of the Los Angeles’ community, who is searching for top-quality medication. The company provides easy and safe access to over 50 strains of MMJ and dozens of various cannabis-infused products. The name wasn’t chosen lightly, The Lab is one of the LA-based dispensaries that incorporates the highest levels of quality control and every flower that you can find here has been tested under laboratory conditions for its potency and safety. The goal here is to improve your well-being, therefore every medical product should be flawless. Friendly and knowledgeable members of staff at The Lab will be happy to discuss your health and come up with the best possible solutions that will help you move towards a better and healthier life.